A-B-Z-TXT, the summer typography school I helped start in Toronto, was never meant to replace a university education. Rather than promising mastery and control of typography, it offers the re-imagining of type across disciplines and with fun workshops and geeky lectures. The inaugural edition of A-B-Z-TXT took place last year (2016). 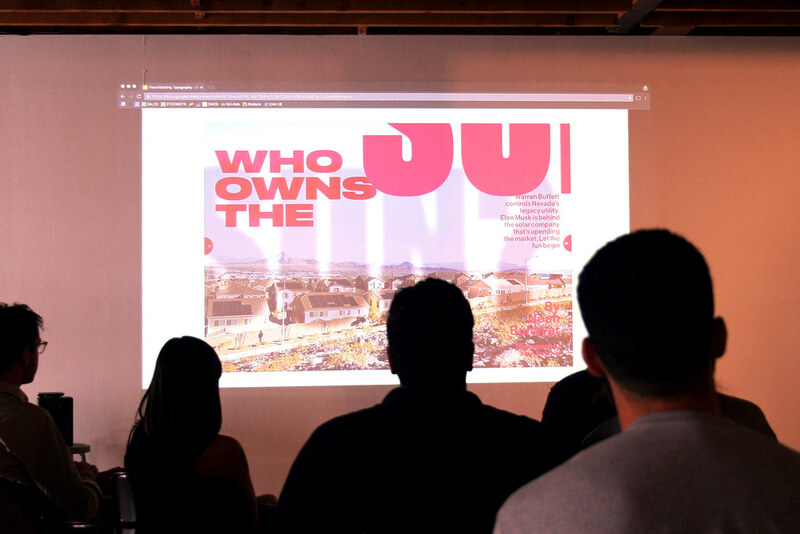 Most participants – professional designers, artists and coders – wanted to break from old-school habits and the routine of their careers, which did not always afford as much creativity and crossover as they initially hoped. Right and top: Tracy Ma from Bloomberg Businessweek and Steph Davidson from Bloomberg.com. A-B-Z-TXT converts into a Bloomberg newsroom. 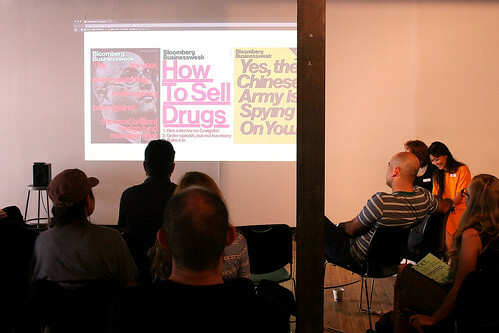 Last year, our first edition welcomed lectures and workshops by visual philosopher Dimitri Nieuwenhuizen from LustLab (see Eye 85) in The Hague, designer Cedric Flazinski from N O R M A L S in Paris, as well as Canadian art directors Tracy Ma from Bloomberg Businessweek and Steph Davidson from Bloomberg.com. Some participants loved working with the wild and irreverent typographic attitudes of Ma and Davidson; others came for the splash of linguistics and politics. 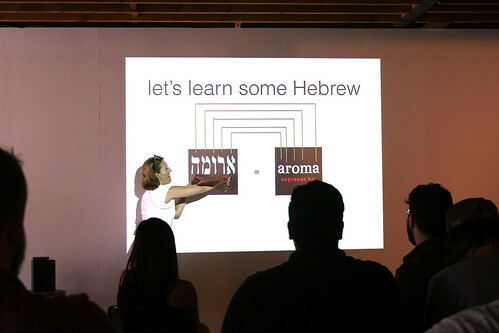 Designer Nitzan Hermon was particularly stimulated by a wildcard lecture by linguist Ivona Kučerová, Associate Professor in the Department of Linguistics and Languages at McMaster University, Hamilton, Ontario. 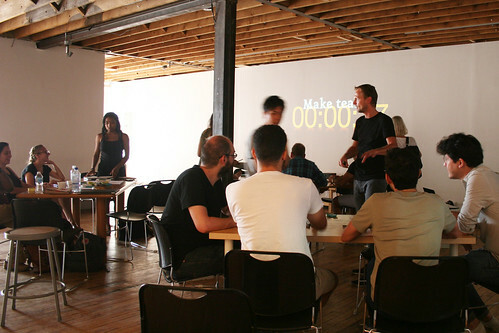 Workshop with LustLab’s Dimitri Nieuwenhuizen, A-B-Z-TXT, 2016. Lecture by Ivona Kučerová, A-B-Z-TXT, 2016. We hope that this year’s A-B-Z-TXT contributors will be equally anti-disciplinary, intelligent, and accessible. Artist Zach Lieberman from New York City will give a lecture and two-day masterclass on typography and computation. This will explore type with openFrameworks, an open source C++ toolkit for creative coders, ‘in a beginner-friendly way’. Designer Mindy Seu from Cambridge and New York City will offer a lecture and workshop. She will explore the ‘poetry’ of interface aesthetics and early computer history. Ali S. Qadeer from Toronto is also giving a lecture and workshop. He will ‘exhume the materiality of text’ by exploring an archive of twentieth-century typography experiments – from the Bauhaus to Jan Tschichold and Carl Dair. Other lecturers will include Toronto sculptor and installation artist Lois Andison, Toronto and Buffalo-based graphic designer Chris Lee, Toronto algorithm designer and artist Xavier Snelgrove, and me, founder of Bureau Michèle Champagne and resident at l’École de design at l’Université du Québec in Montréal. Lee and I will explore the way typographic form relates to politics and statecraft – from clay tablets to blockchain … and local mayoral campaigns. Andison will comment on language as artistic medium and Snelgrove will address predictive text and the syntax of emoji. Michèle Champagne, designer and writer, Montréal, Canada.